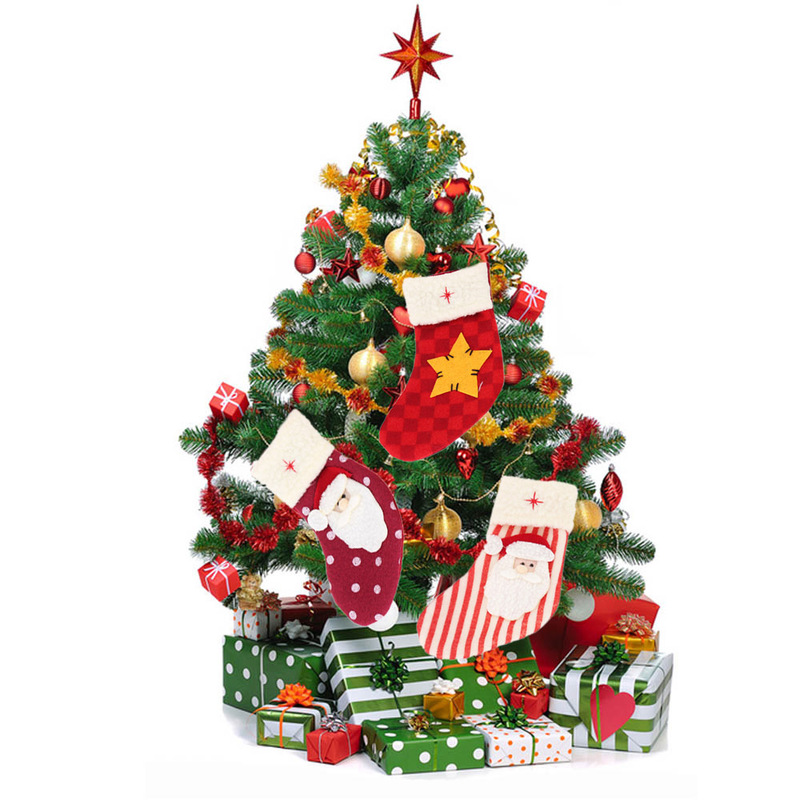 The holiday fervor is always high during the Christmas. Even if you are short of space, you needn’t cut down on your preparations. 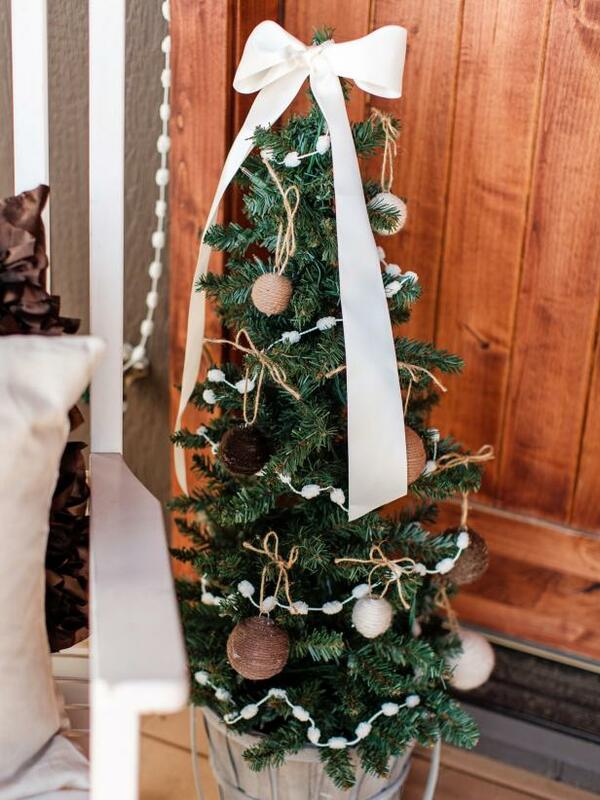 You need not always invest in a huge tree to bring the festive look to your home. 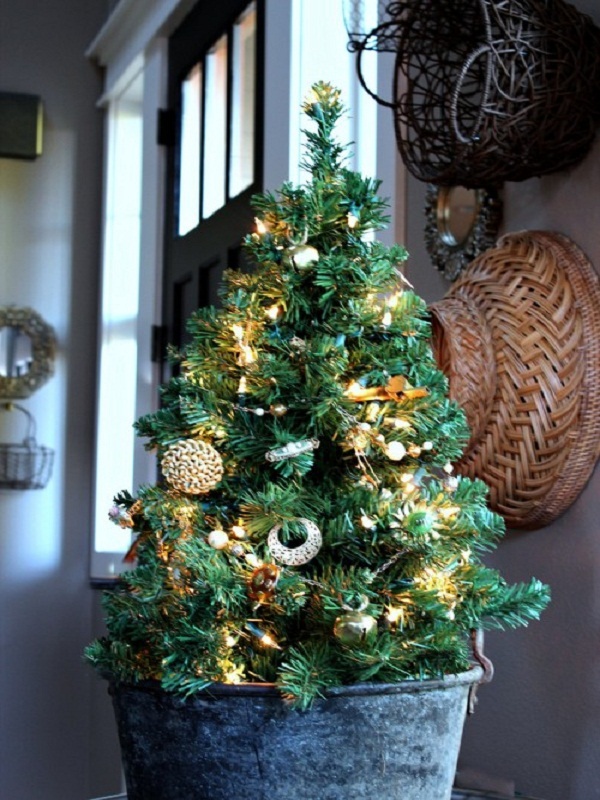 Instead, a small Christmas tree aesthetically decorated can fill all the gaps elegantly and it’s a huge space-saver as well. 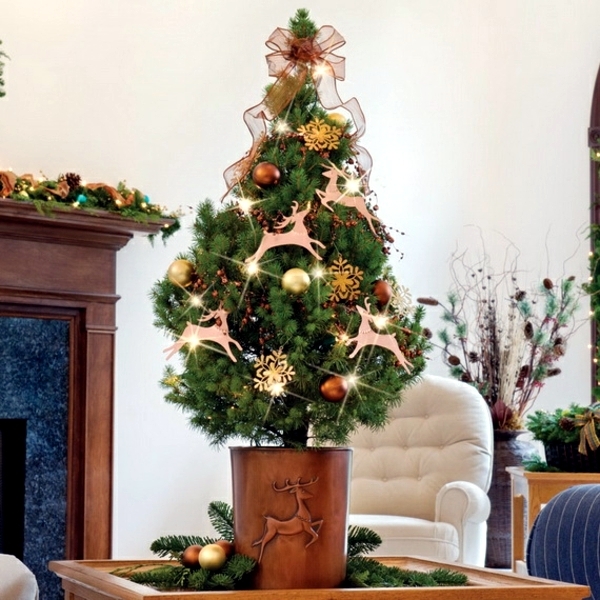 There are many innovative and brilliant ideas to decorate the shorter and trimmed trees. Here, we have given you the top 40 such ideas to begin with. 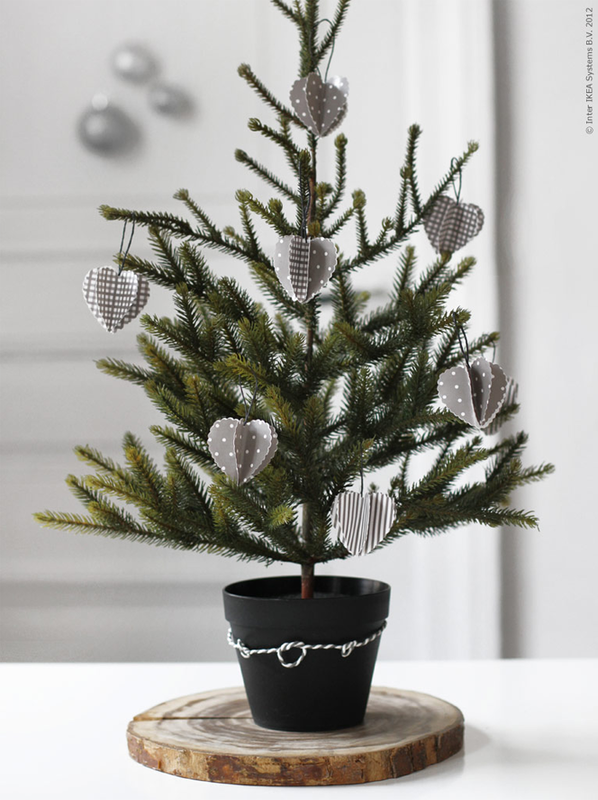 What can a better idea than putting a pretty small Christmas tree on the table? The cute paper birds and ribbon flowers are adding to its beauty. 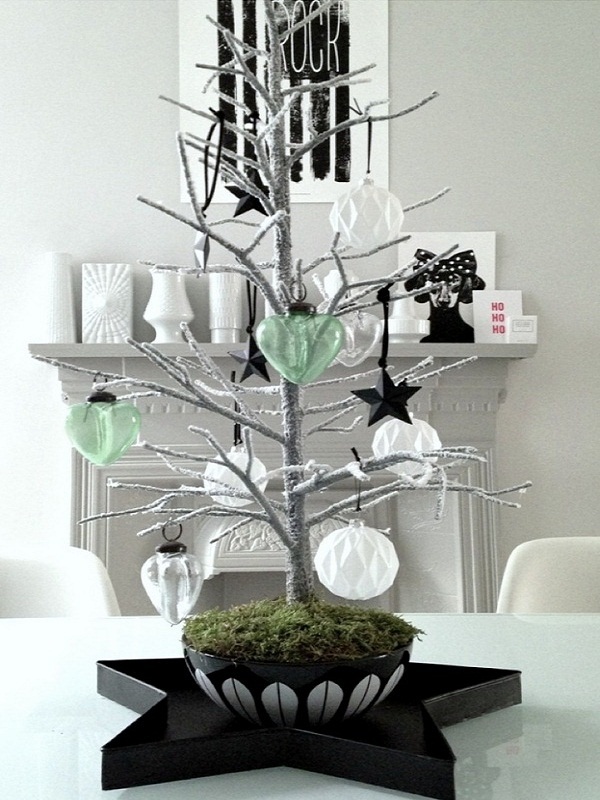 These cute gray hearts hanging from this small Christmas tree are looking so elegant and classy. 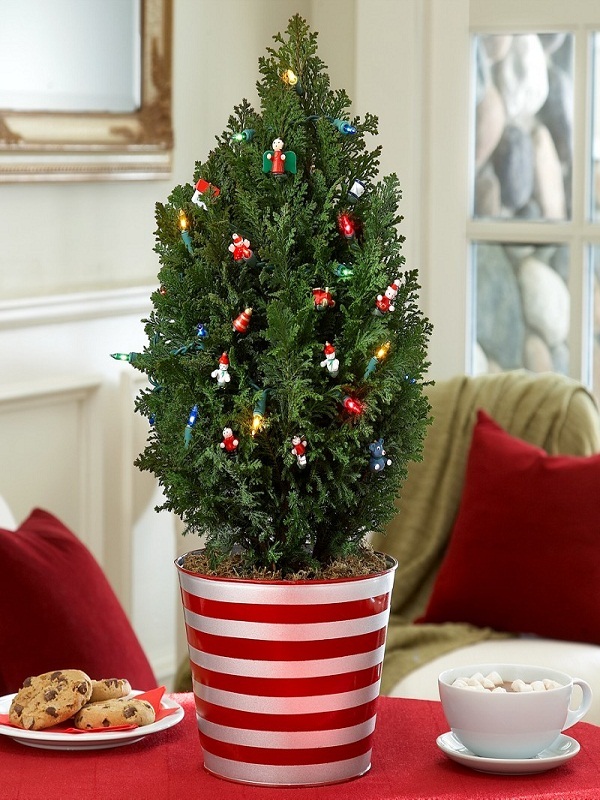 A cute and small Christmas tree with an equally adorable striped bucket. The miniature angels and snowman hangings, as well as lights, are looking fantastic on it! 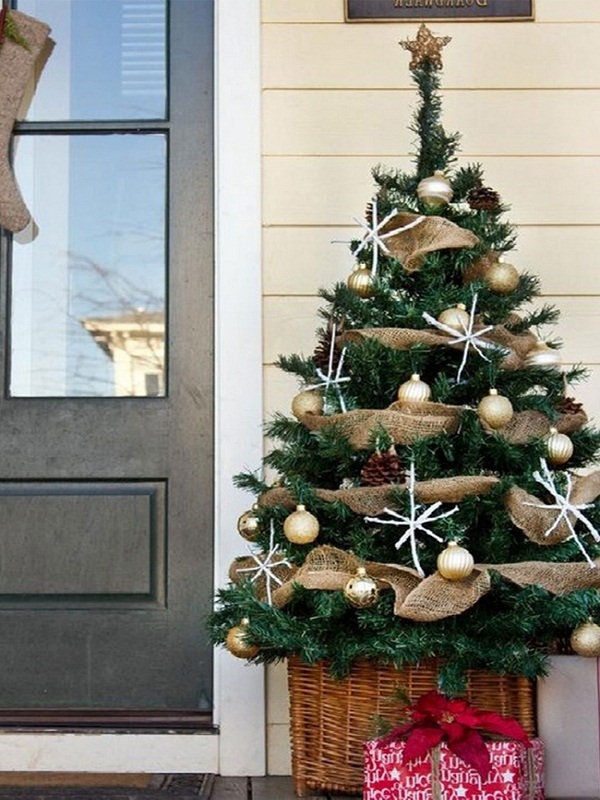 This small tree on the front door is simple and very pretty. 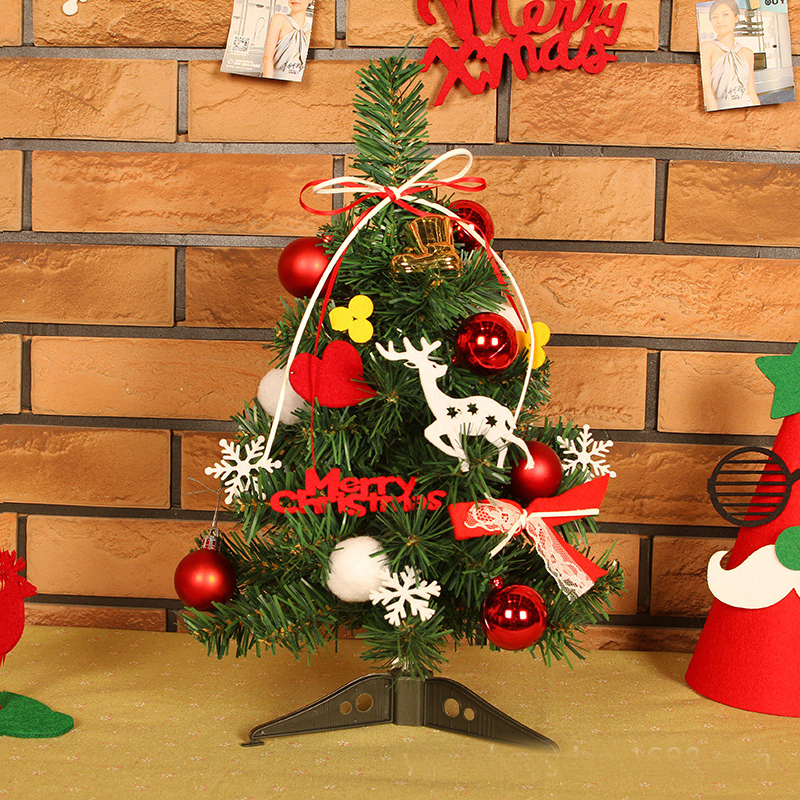 The cute red ornaments and felt reindeer decoration on this tree are accentuating its beauty manifold. 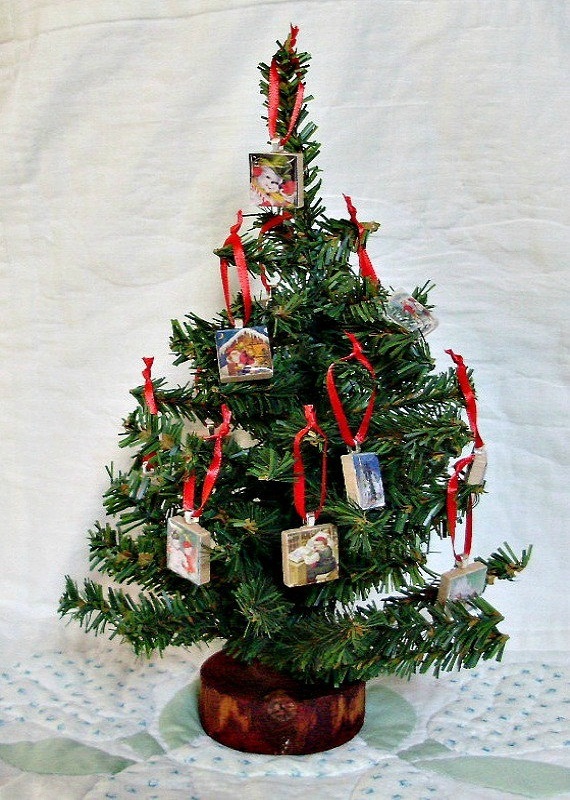 This small tree is decorated minimally with the cute picture blocks hanging with the red ribbons. This one is so pretty and unusual. The color combination is perfect for a minimal decor! 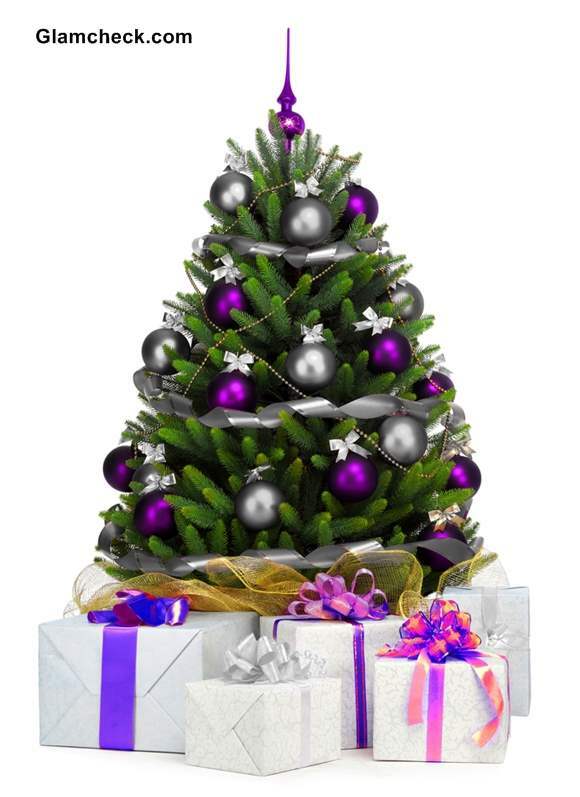 Loved the purple baubles completely! A completely Christmasy tree decoration! The tree has cute paper ornaments hanging beautifully from its branches. 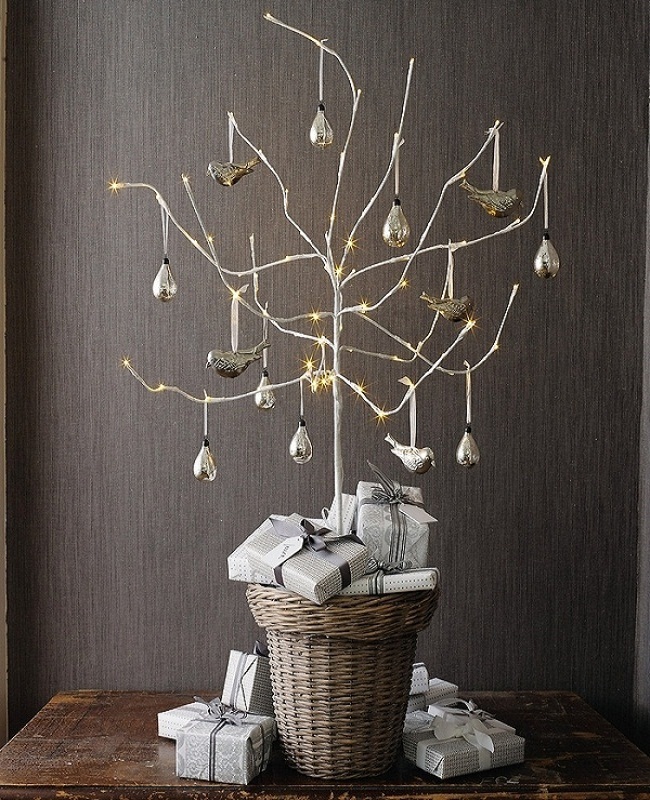 This is a superbly elegant decoration using fairy figures in silver. 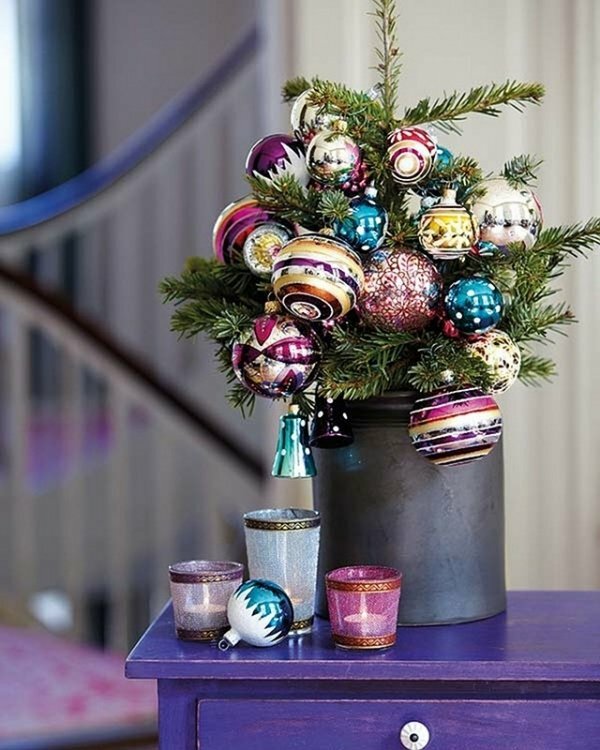 The pot is adding the pop of color to this small tree. 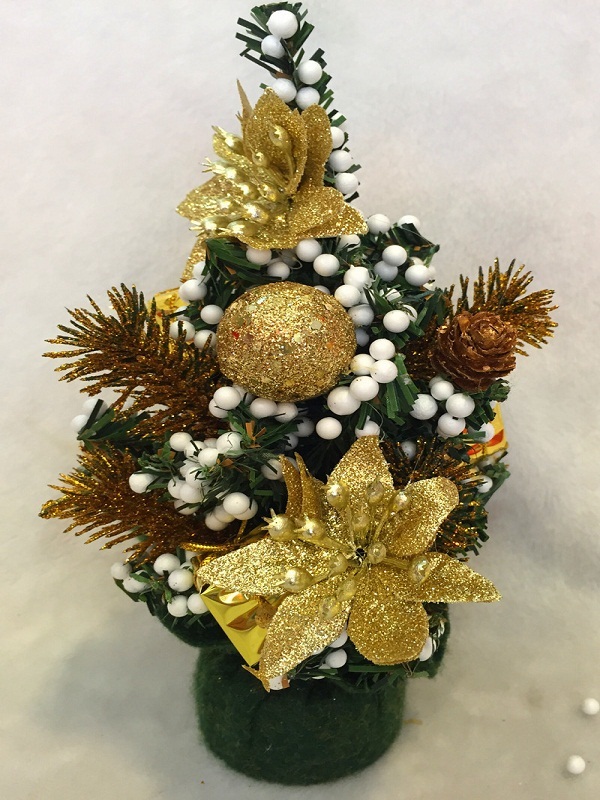 This tree is uniquely decorated with the gold jewels and jingle bells for a vintage appeal. The most innovative feature is the iron pot, though! 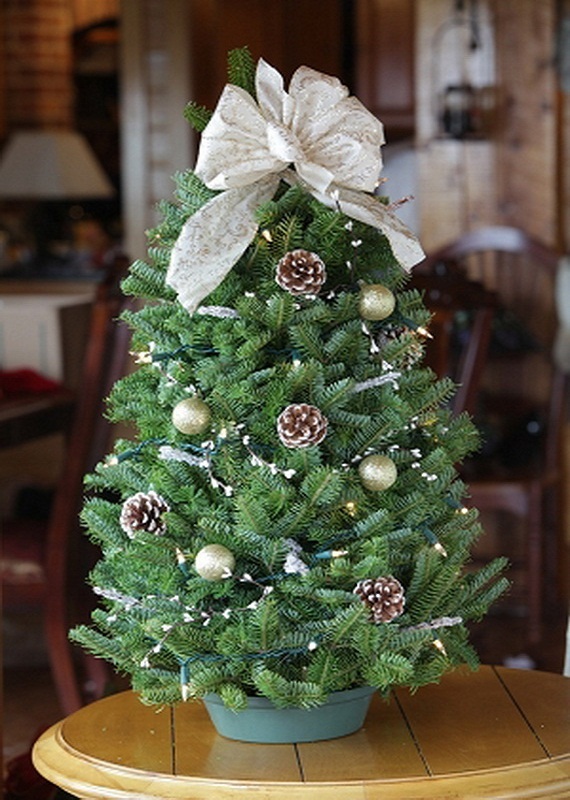 This is a beautiful small Christmas tree for your living room. 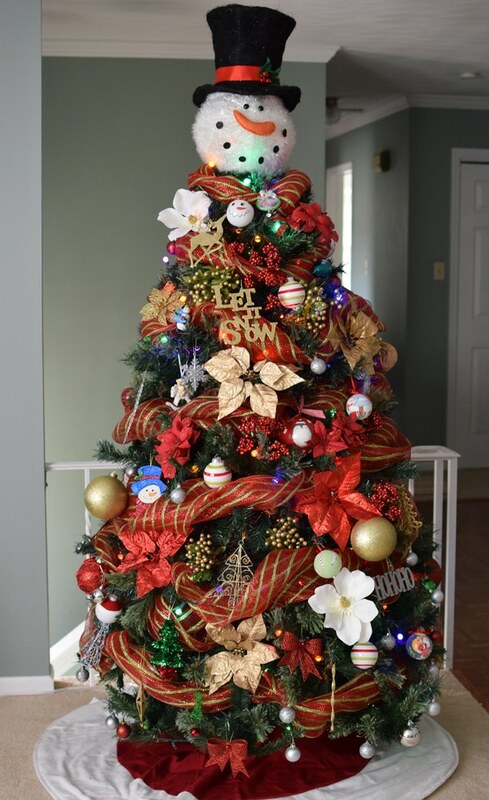 The yarn balls as the ornaments and tail yarn as garland makes this tree so unique. And the white ribbon bow on the top is simply elegant! A perfect centerpiece for your table! 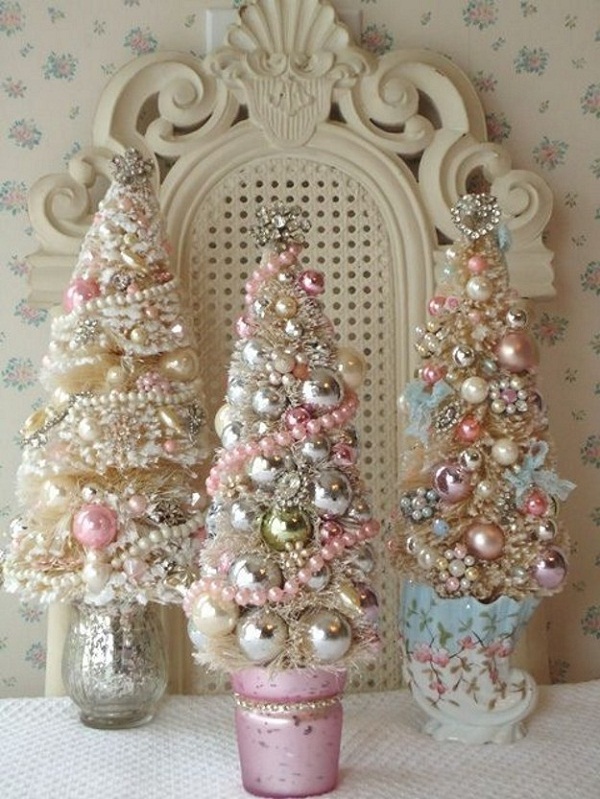 These embellished miniature trees are looking so pretty that you will certainly want one for your home this Christmas. 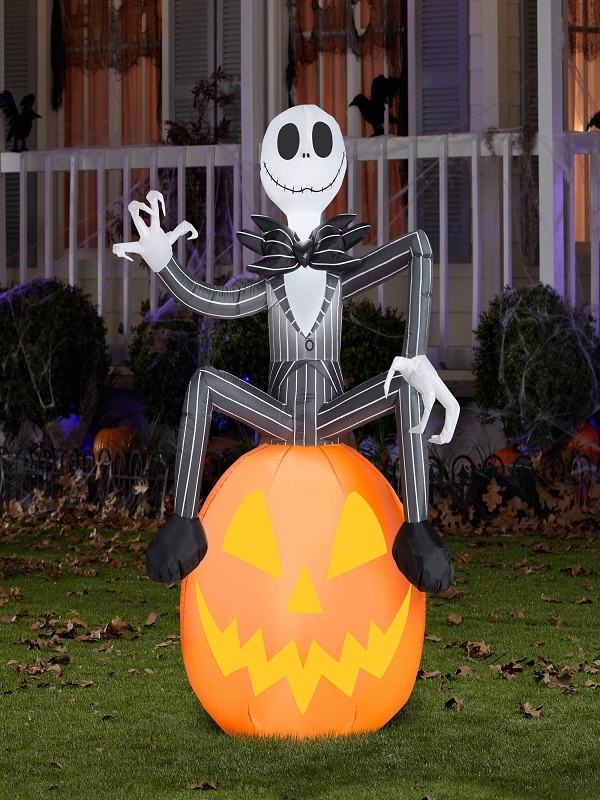 This decoration is so offbeat. 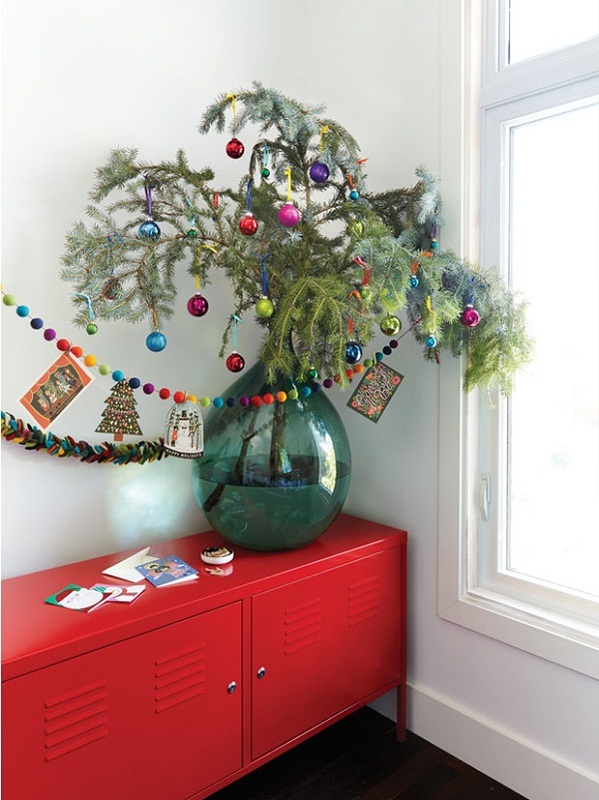 The tiny and colorful baubles hanging from this tree are perfectly matching the decoration around it. 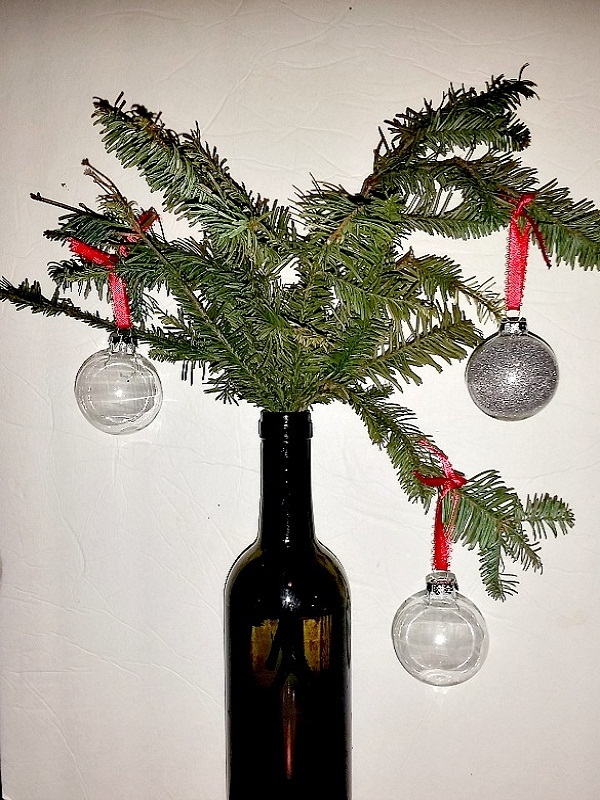 The old wine bottle is serving its purpose beautifully in this decoration idea. The glass ornaments are looking pretty in this decor. This is an amazing small Christmas tree decoration that your kids will definitely love to have in their room. This is a beautiful small tree decoration. The vase is giving it the required height and the glittery decor is so flamboyant! 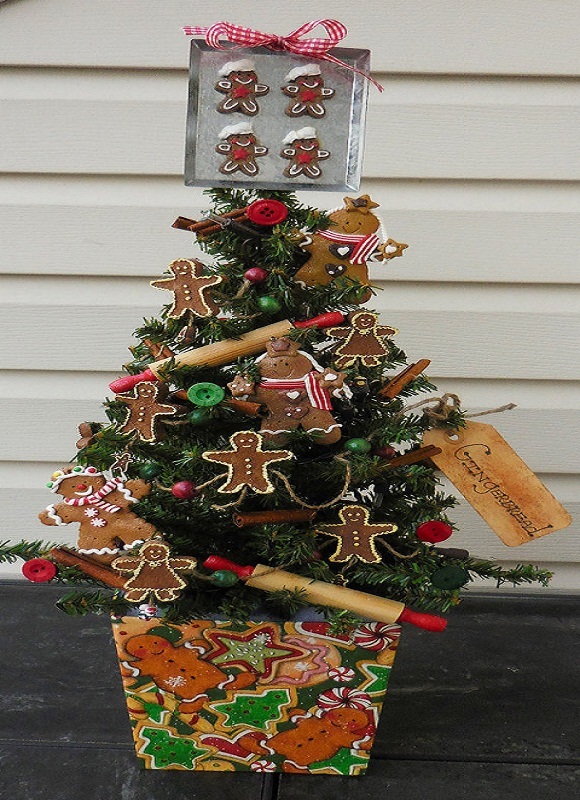 Do you have lots of cookie cutters in different shapes? 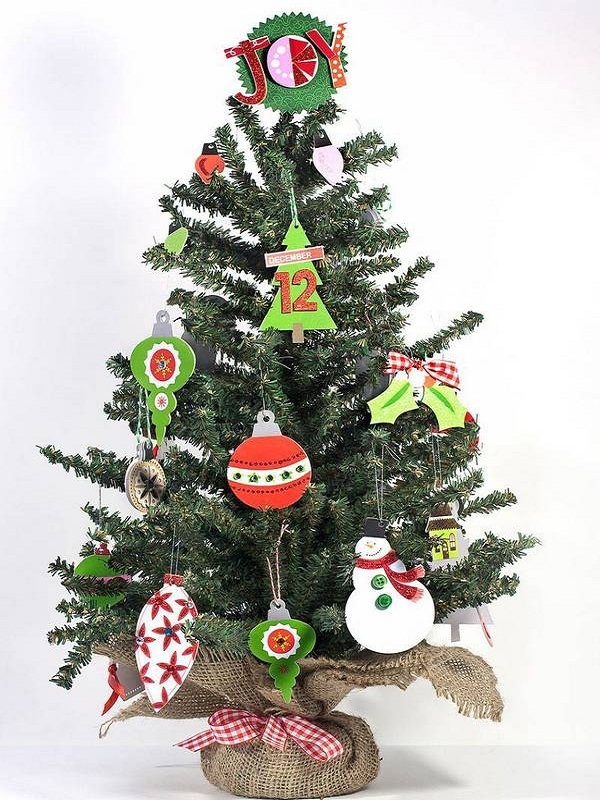 Try this decoration idea made from cookie cutters wrapped in printed papers and hung beautifully from a small Christmas tree. 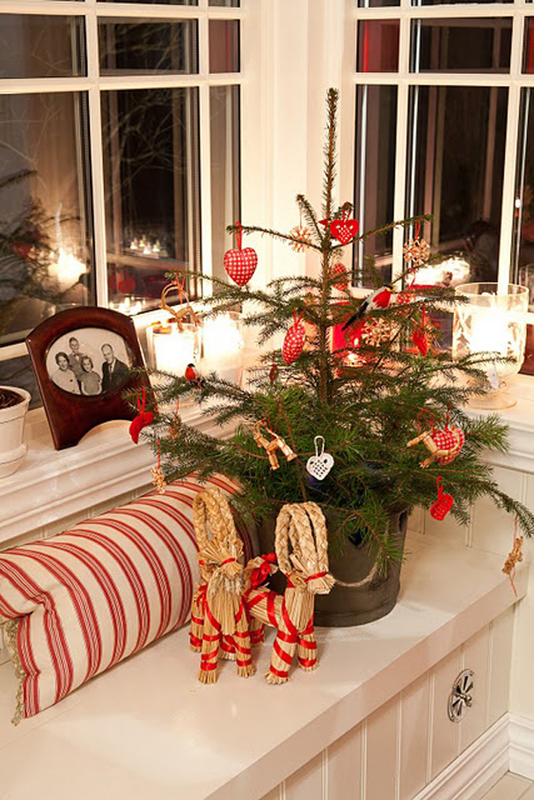 This reindeer decoration is also a unique style of adorning your living spaces with small Christmas tree. 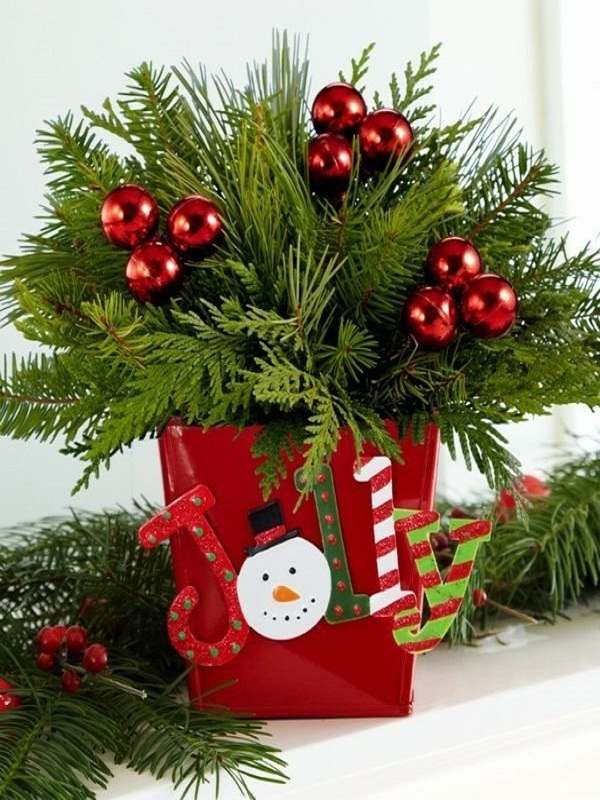 Gather some small fir branches and place them beautifully in a red pot. 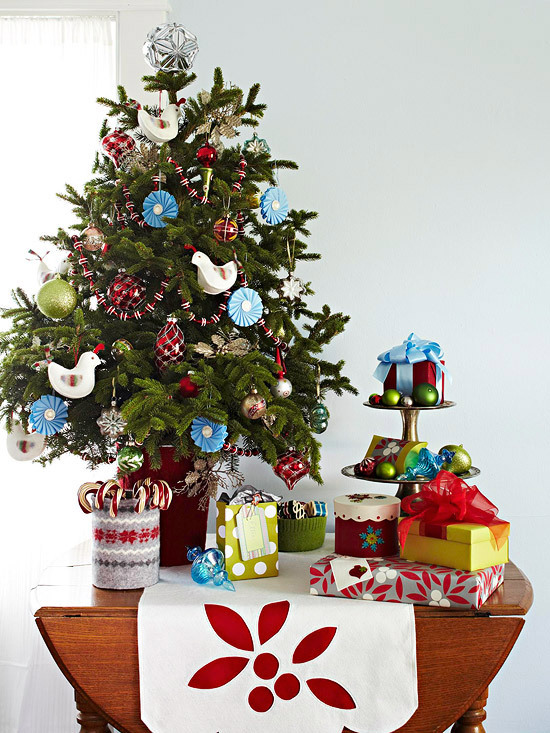 Decorate with these cute red baubles and your stunning tabletop Christmas is ready. A pretty Light bulb and birds decor! What do you say? 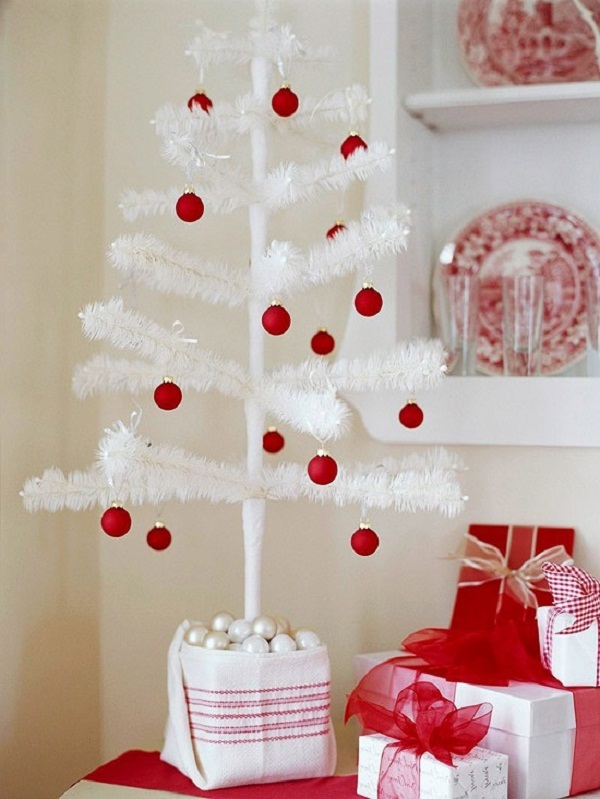 You can never go wrong with a classic decoration with red and white color theme. 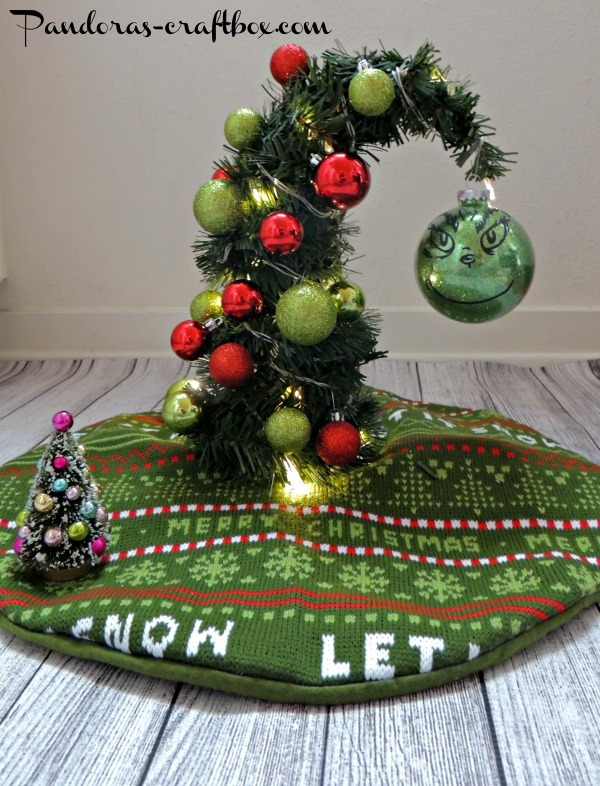 This is a creative DIY idea to make your own small Christmas tree and decorate it with glass ornaments painted as Grinch. The pristine mini Scandinavian decoration! 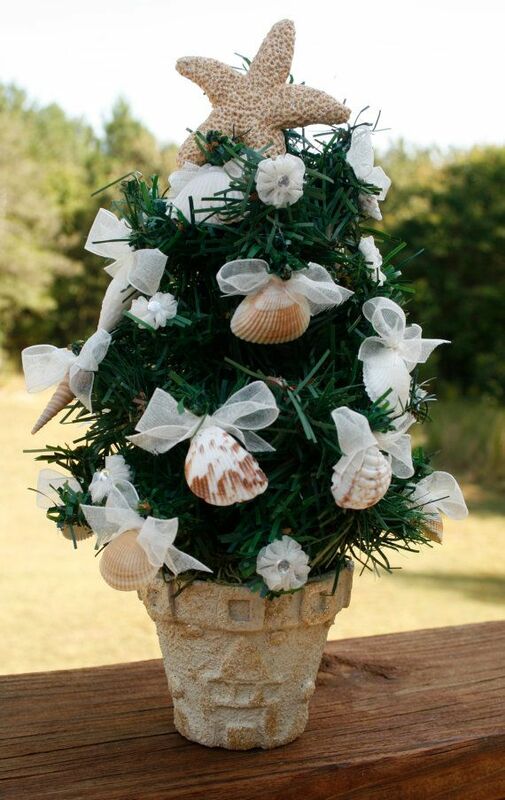 A Christmas tree decoration on the theme of the beach? Sounds interesting and looks so pretty! Use pine cones in this way to decorate your small tabletop Christmas tree. 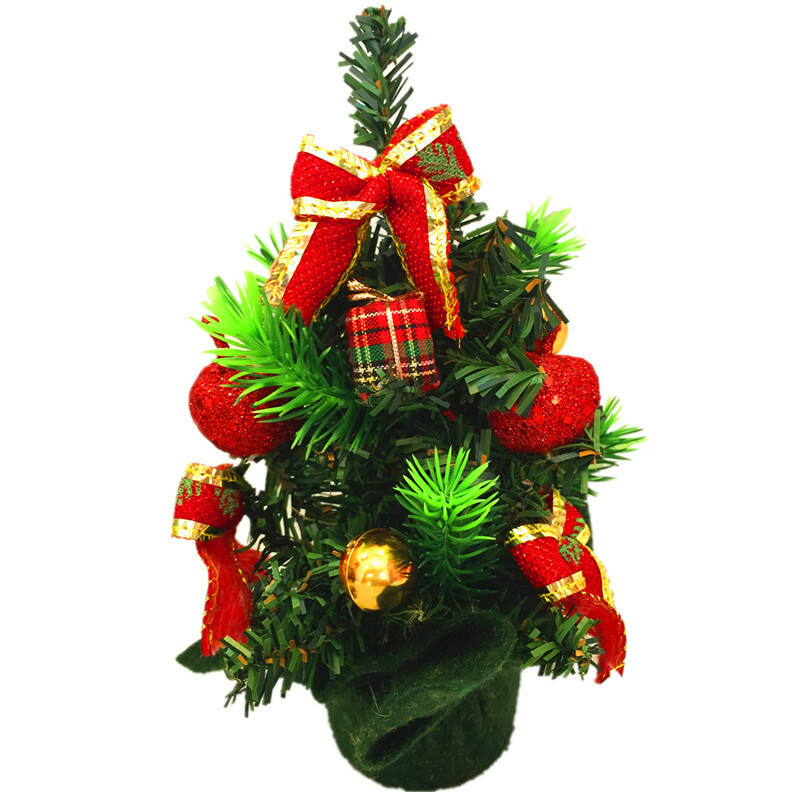 This is a cute and colorful small Christmas tree decoration. The snowman face on the top is the highlight of this decor. 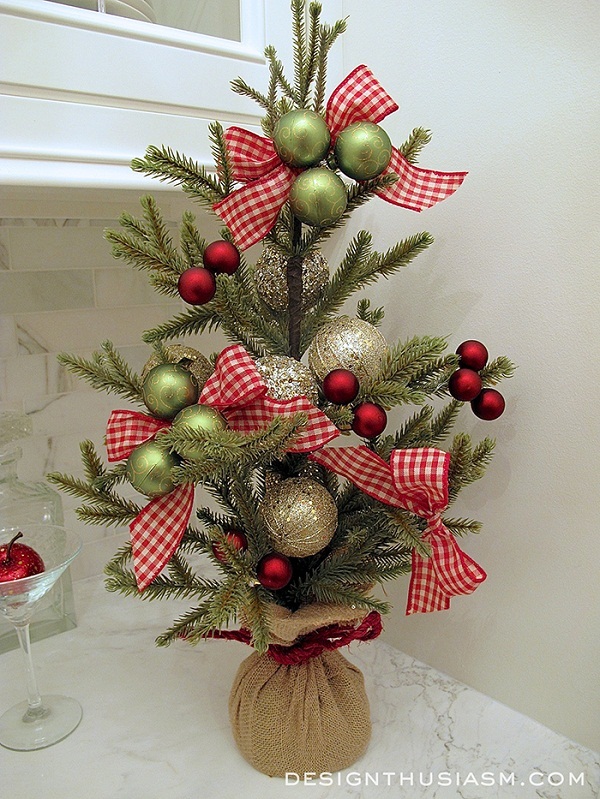 The cute bows on the Christmas tree also add the festive fervor to your holidays. 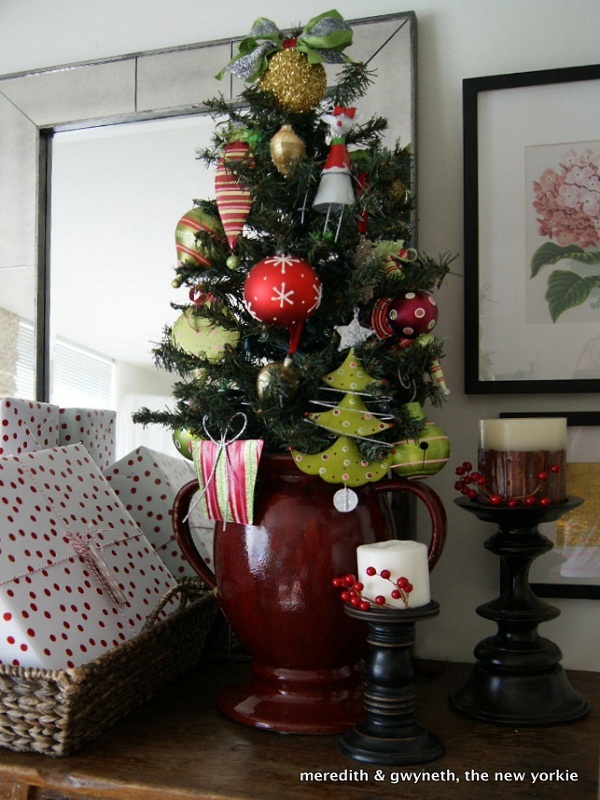 I loved the bold red ornament on this tree! 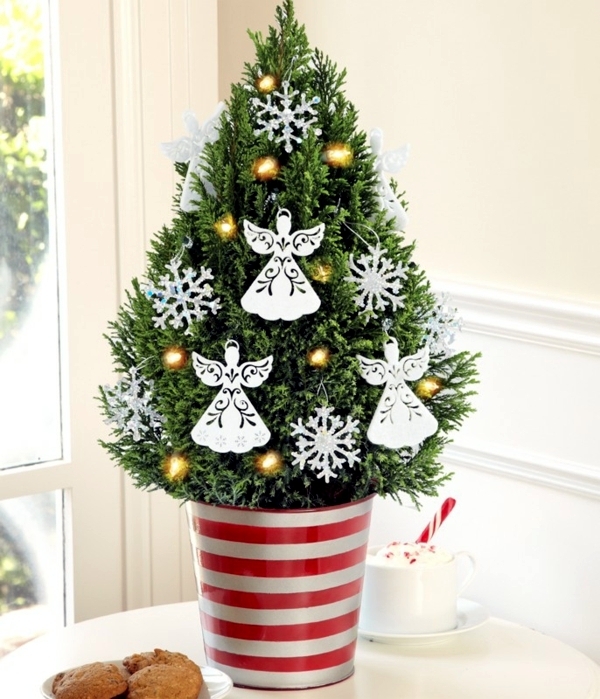 This mini Christmas tree is looking adorable with the red and white stockings. A gold Christmas tree decoration is always elegant. In this tree, the glitter of gold is simply outstanding! 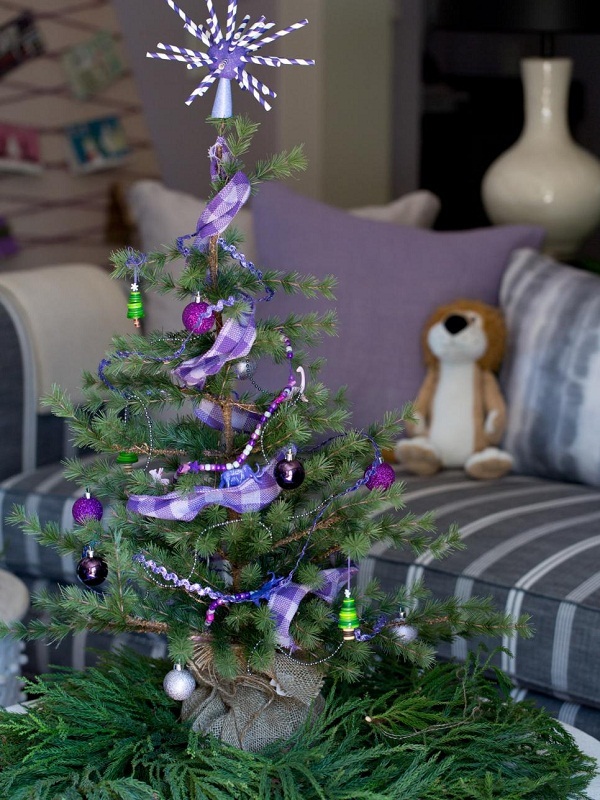 An elegant purple small Christmas tree decoration is not only beautiful but also offbeat. 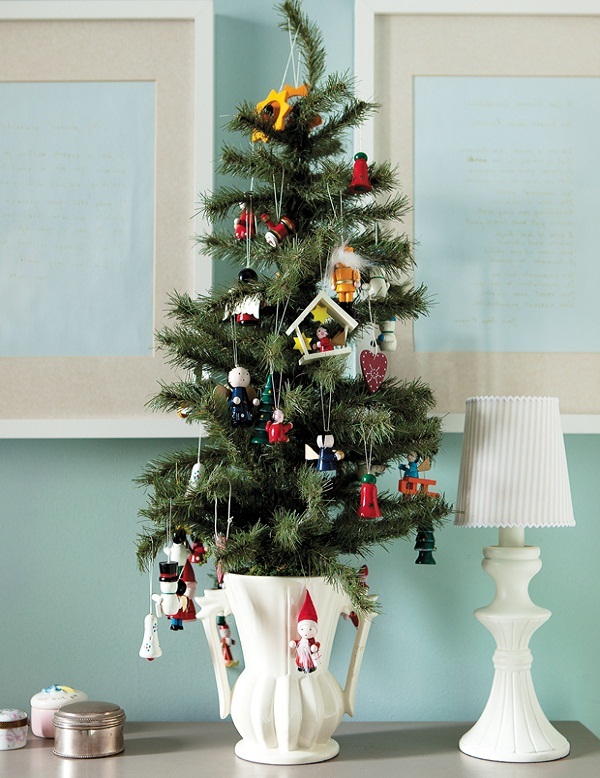 A little Christmas tree in a beautiful white vase and decorated with pretty wooden toys. Kids will definitely love this one! This is an elegant tabletop Christmas tree decorated with red bows and striking green baubles. 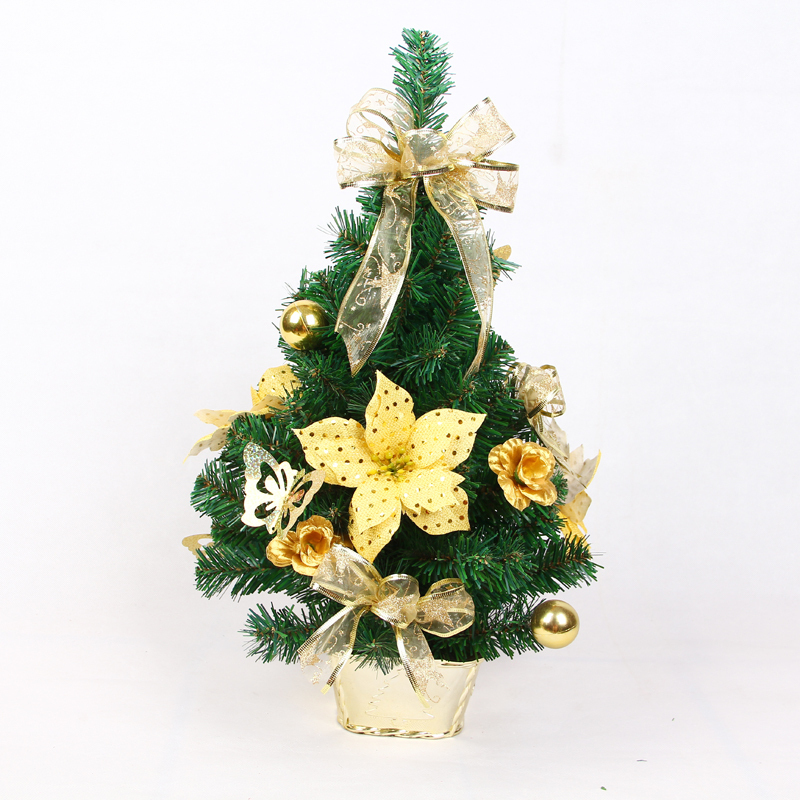 This small Christmas tree is looking flamboyant with golden butterfly ornaments, beautiful flowers, and a pretty bow on the top. 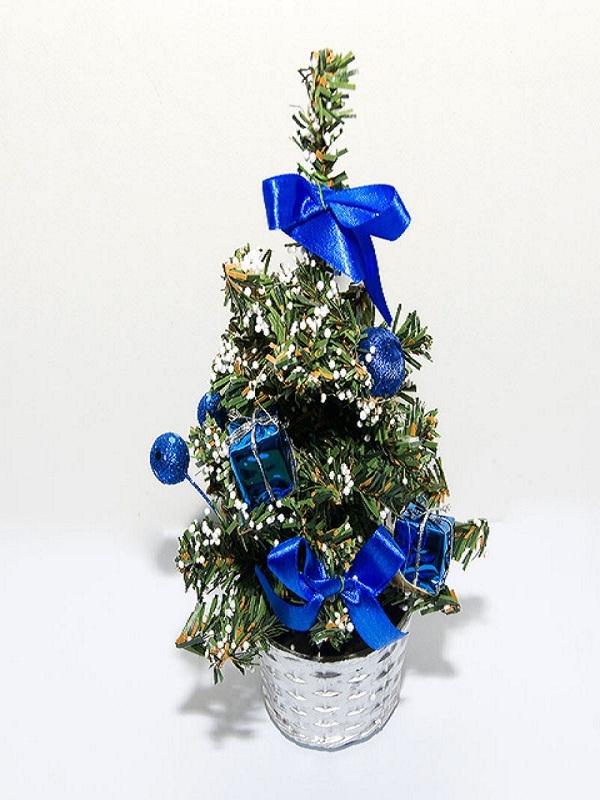 Add the dash of style and contemporariness to your holiday decor by adorning your small Christmas tree with blue ornaments and bows. 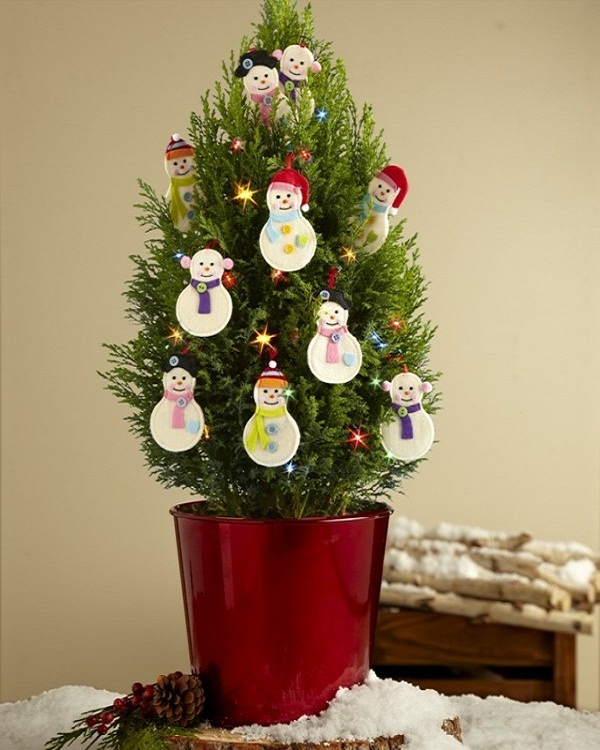 These small snowmen in pretty colors are looking so cute and Christmasy. Aren’t they? 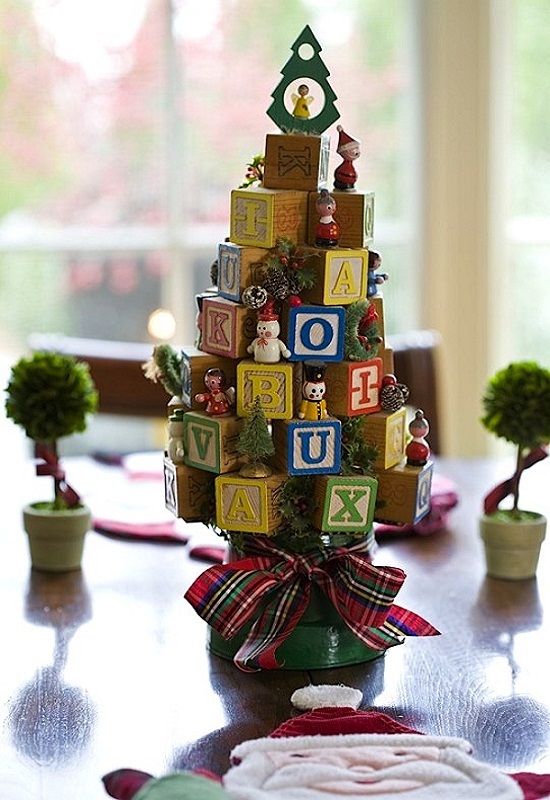 This is a fun decoration using the gingerbread. The pot is equally amazing. The attractive colorful baubles in this Christmas tree decoration are so appealing and pleasant. 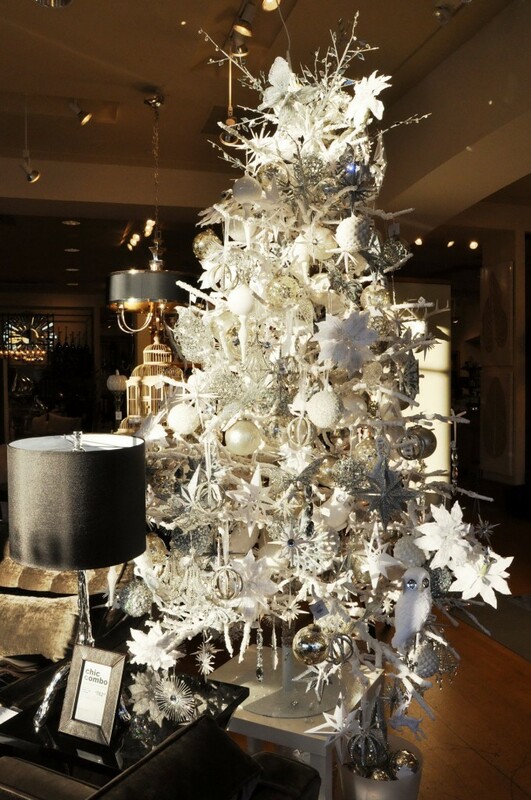 A white small Christmas tree decoration is always fascinating! 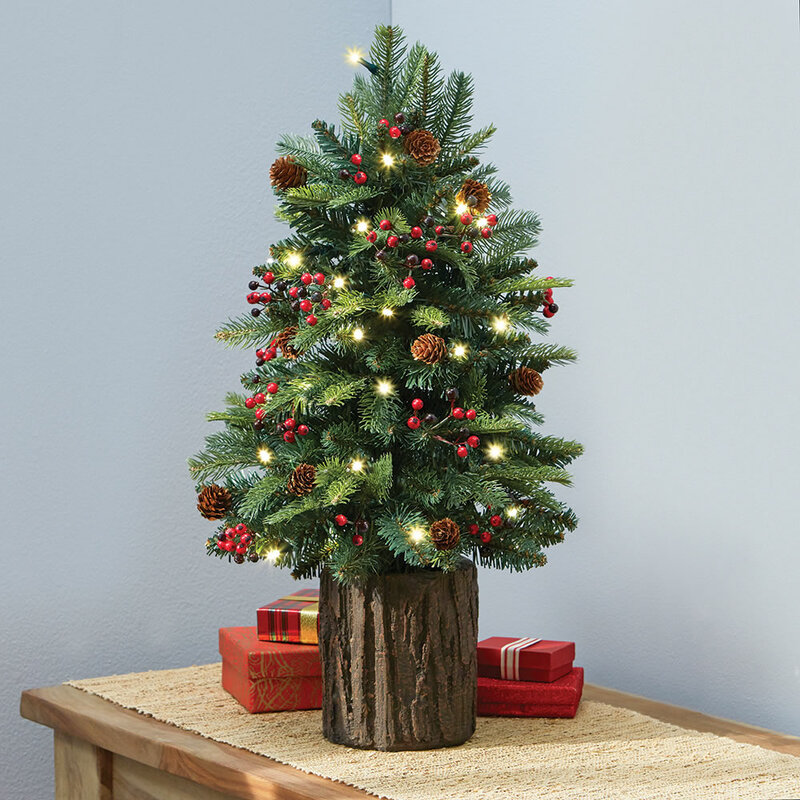 This prelit tree will add the lighting effect to your Christmas decorations. It has a typical rustic feel as well. 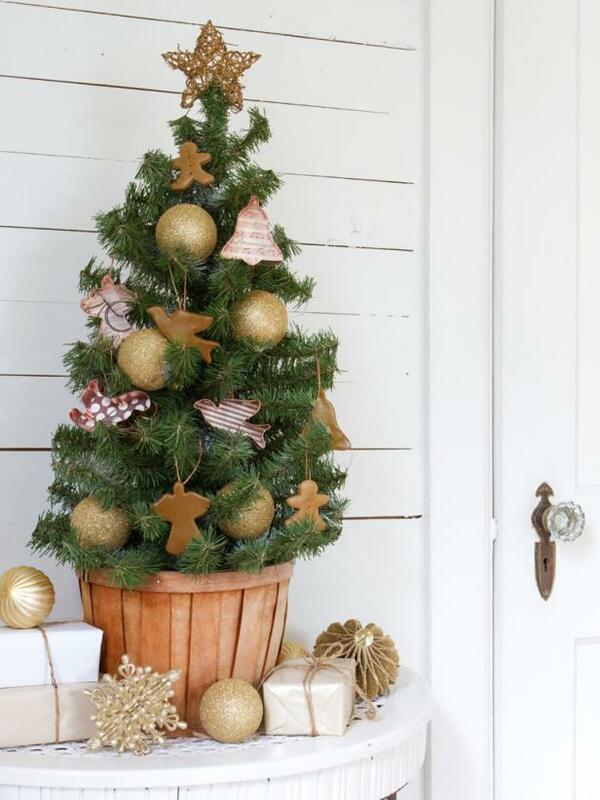 These are the top 40 small Christmas tree decoration ideas that you can try. They are fun, amazing, and cute for your lovely home.